The much awaited RBI Grade B Officers Recruitment 2016 notification is looked upon to generate a lot of responses among bank job aspirants. Recently, Reserve Bank of India (RBI/Bank) invited applications for the Officers in Grade ‘B’ (General) - DR – Batch Year 2016 from Indian citizens, citizens of Nepal and subjects of Bhutan, persons of Indian origin who have migrated from Myanmar and Sri Lanka with the intention of permanently settling in India and in whose favour Eligibility Certificates have been issued by Government of India. (iv) Reasoning, with composite time of 120 minutes. Other detailed information regarding the examination will be given in an Information Handout, which will be made available for the candidates to download along with the Admission letter for examination from the RBI website. 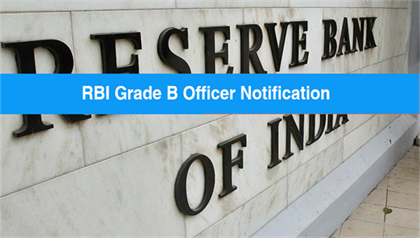 The next phase of the RBI Grade B Officers selection process is of RBI Grade B Officers interview. Candidates will be shortlisted for the RBI Grade B Officers interview, based on aggregate of marks obtained in Phase-II (Paper-I +Paper-II +Paper-III). The minimum aggregate cut off marks for being shortlisted for Interview will be decided by the Board in relation to the number of vacancies. Roll No. of the candidates shortlisted for interview will be published on RBI website at appropriate time and interview call letters will be sent on registered email ID. RBI Grade B Officers interview will be of 50 marks. Candidate may opt for interview either in Hindi or English. Final Selection will be through merit list which will be prepared by adding marks secured by candidates in Phase-II examination and interview. Candidates who get through both phase of online examination have to appear for RBI Grade B Officers interview . To prepare for the RBI Grade B Officers interview many competitive exam preparation books with solved papers and tentative types of questions asked in RBI Grade B Officers interview are available in the market. Why you want to enter in Banking industry? Why are you not working anywhere from past 6 months ? Can you shift to another city ? Why you left your previous job ? Why don't you join your father's business ? What are various services provided by a commercial bank ? What are various investments under section 80(C) of Income Tax act? What was the purpose of setting up NABARD? NABARD is the apex institution for the development of farm sector cottage What are various functions of RBI? What is IRDA and what are its functions? What is an Option in derivative market ? What is Call option and Put option ? What is safest type of fund ? Mutual Fund is a pool of fund where investors invest their money for a common? I hope this complete guide to RBI Grade B Officers selection process along with types of questions asked in RBI Grade B Officers interview will help you in your bank examination preparations. Do like, comment and share this article if it has helped you in fulfilling your examinaytion queries.